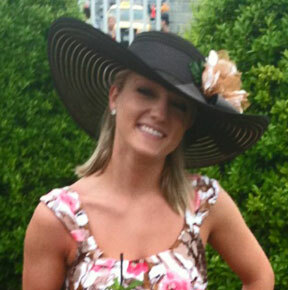 LADIES WEARING THEIR HAT-A-TUDE HATS AT THE KENTUCKY DERBY AND RACES! Lovely ladies in their HAT-A-TUDE Derby hats have been so kind as to share their pictures from the Kentucky Derby, Horse races and parties. Real women in Hats! 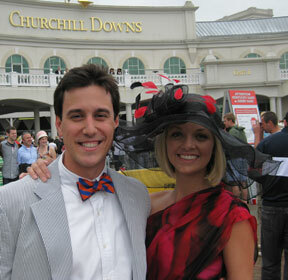 I hope this helps you with the big question: What should I wear to the Kentucky Derby? 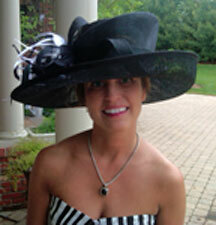 Go to the Derby Hat Online Catalog to find Your Hat! Do you want a personal Hat consultation? I am YOUR Hat Designer! I live in St. Petersburg, Florida in the beautiful USA. If you live nearby you may visit my studio by appointment. Be warned, it is a working studio so frequently not very neat…creative mind at work! However, if you do not live in the area you may email me your picture and/or your dress and I will do my best to help you select the best hat for you. 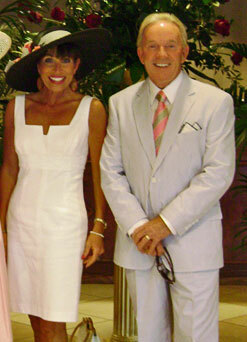 I want you to look fabulous as you attend the Kentucky Derby, Party or Horse Race. A hat is not complete without a smile coming from beneath it. After all, if you don’t look good, HAT-A-TUDE doesn’t look good. My clients are my inspiration. The fact that I care so much about providing personal service sets me apart from the “big box” online hat sellers. As one lovely client wrote: “I'm overwhelmed with this gorgeous hat. One thing for sure and I know A**** is competitive but there's a difference between class and cash….May be cheaper but your hats are quality!” Makes my heart sing! 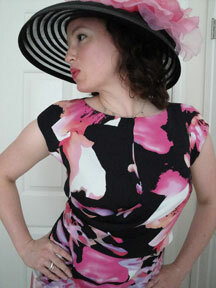 Want to look fabulous in your Hat on Kentucky Derby Day? It is very important your hat FIT properly! Your Hat should not be sitting down over your ears (well, maybe a little if it is being worn at a jaunt) or up on the tip top of your head. Poor fit is one of my pet peeves. It is the reason I provide instruction on the HAT-A-TUDE website on HOW to measure your head and WHY I sell hats by head size in inches. A hat that is too big will slide all over your head and a hat that is too tight will make your head hurt. Your hat should be a pleasure, not a distraction. After all you will be walking, eating, drinking and cheering on your horse…in other words on the move! So please measure your head before ordering! 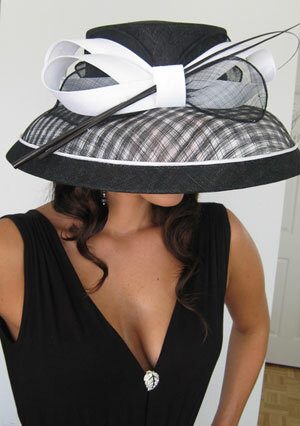 Of course Fascinators and Profile Hatinators are mounted on a headband and allow for more flexibility in size. If you have questions, I am just a phone call or email away. For more info go to What’s My Hat Size Page. The Kentucky Oaks is run the Friday before the Kentucky Derby. The first running of the Kentucky Oaks (and the Kentucky Derby) was on May 19, 1875. The race was founded by Meriwether Lewis Clark, Jr. and has been held continuously at the same race track location in Louisville, Kentucky. The Oaks is to celebrate the Ladies. Three year old fillies (female thoroughbred horses) run in the Oaks race. It is frequently called The Run for the Lilies since the official flower is the pink stargazer lily and the flower garland that covers the winning horse. Since 2008, the Oaks has also been the “Pink Out”! To honor breast and ovarian cancer survivors, PINK is worn by attendees at the Oaks. 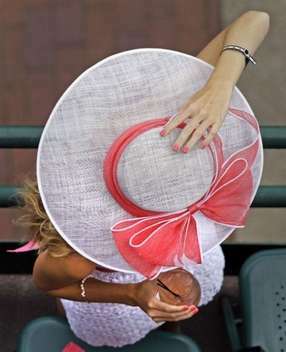 So if you are going to the Kentucky Oaks you will need a hat with pink trim or a pink hat. 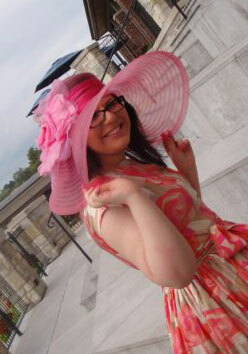 I have a lot of Pink in my Derby Hat Catalog! All shades and combinations and can “Pink Out” out your hat selection. 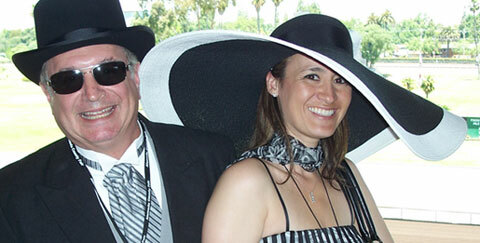 **FYI: To answer your question: If you are attending both the Oaks and Kentucky Derby, YES you will need 2 Hats! How Big of a Brim Hat should I wear to the Kentucky Derby? This depends on a number of choices: How tall you are and how much “drama” do you want to carry on your head all day. 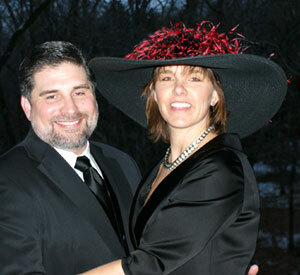 A hat with a 5 inch brim looks proportionate on a 5’ tall lady and small on a 6’ tall lady. Also if you are petite you will be bending your head back all day to look at people in a XL large brim…ouch! 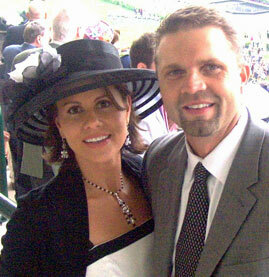 Usually 6 inches is a good dramatic size brim on all women for the Kentucky Derby or Kentucky Oaks. To truly be over the top, go for an 8 inch brim hat! Many of my clients choose this option. Consider the Derby is a long day and you will be colliding with doorways and others! For any hat proper FIT is very important. Read more on this subject on my page What's my Head Size. 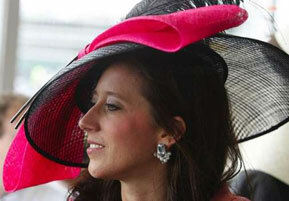 One way to get the spectacular big hat look is to choose a profile fascinator or hatinator. This style is mounted on a headband (also fits more head sizes!) and more vertical than horizontal. Profiles have become very popular in England. I heard one reason is more people could be packed into Ascot. Purely hearsay, but sounds logical to me. Your outfit and your Derby Hat has to fulfill YOUR vision! Let Kathi @ Hat-A-Tude help you. 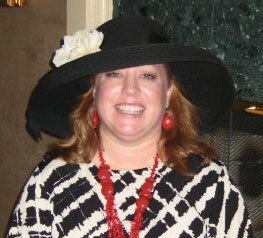 Each year I ask my Hat-a-Tude clients to send me pictures of themselves and their Hats to post on the website. I feel it is important for ladies to see what outfits and hats are actually worn to the Kentucky Derby and Derby parties. One thing I notice is they are all smiling under those Hats! It has been my intention to be sure you are wearing the best hat for you...your height, head size and color of outfit. I love seeing those smiles and know others are smiling back at you and telling you how great you look. If you don't look good, Hat-a-Tude doesn't look good! Women wearing hats are at once sophisticated and whimsical....Their faces are younger and softer. A piece of magic is a hat! 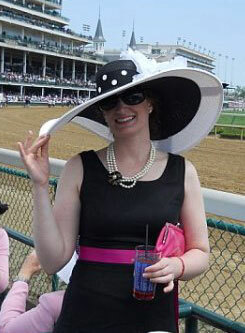 May your Hat keep you cool and bring you luck at the Kentucky Derby. The Kentucky Derby is not only the most famous thoroughbred horse race in the US, but also a celebration of fashion, Hats, southern culture and tradition. 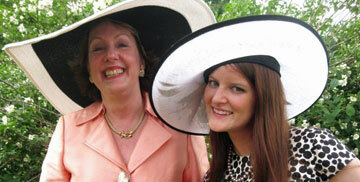 The Derby is all about the Ladies HATS! 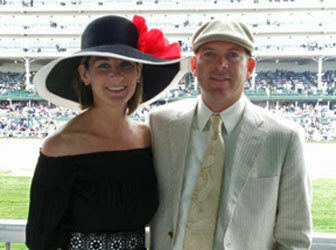 I feel national television shows as much coverage of the Hats as the Horses on Derby Day! 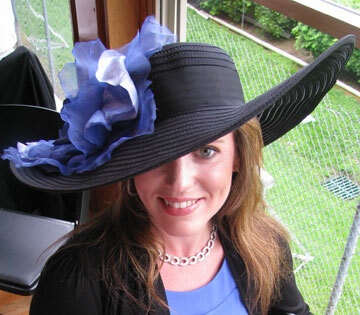 In addition to the Kentucky Derby, ladies also enjoy wearing their Hats to Derby parties, polo races and other horse racing events. 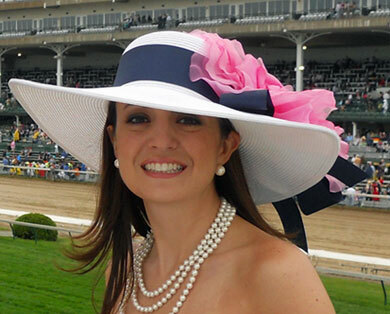 What is a "Derby Hat"? A hat with a bigger brim and some "personality"....from the silly to the sophisticated. Hat-a-Tude designs reflect a sophisticated style with quality ribbon, flower and feather trims customized to compliment your outfit. 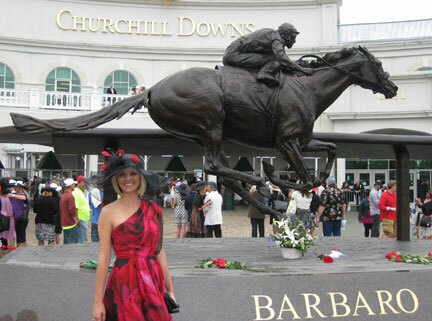 I am a boutique Hat Shop available to work with you in creating your special outfit for the Kentucky Derby. For the hours a woman wears a hat, it brings out a different dimension in her personality. Hats are to be stylish in, glow under, flirt beneath, make all others seem jealous over, and make all men feel masculine about. A piece of magic is a hat! May your Hat keep you cool and bring you luck at the Kentucky Derby.